Shining Cranesbill has tiny flowers that no not seem to get on well with one another: they are invariably well spaced apart, making for less impressive floral displays than most of the other wild geraniums. 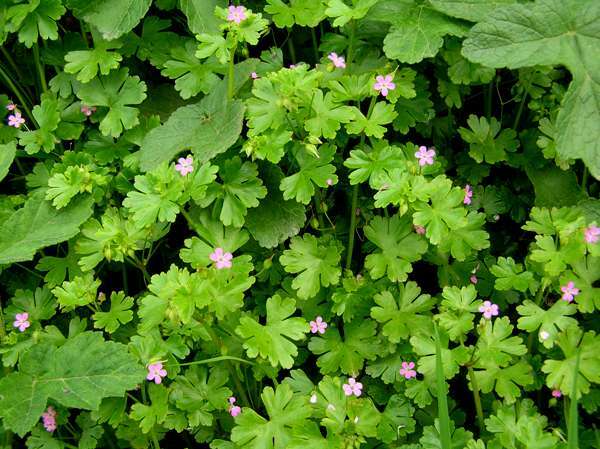 This perennial upright or sprawling wildflower can gro to a height of about 40cm. The stems and leaves are almost hairless. It is the glossy five-lobed roundish leaves that give this wildflower its common name; they develop a waxy sheen and in dry locations turn bright red as the summer draws on and so their shiny surfaces make up for any limitations of the floral display. 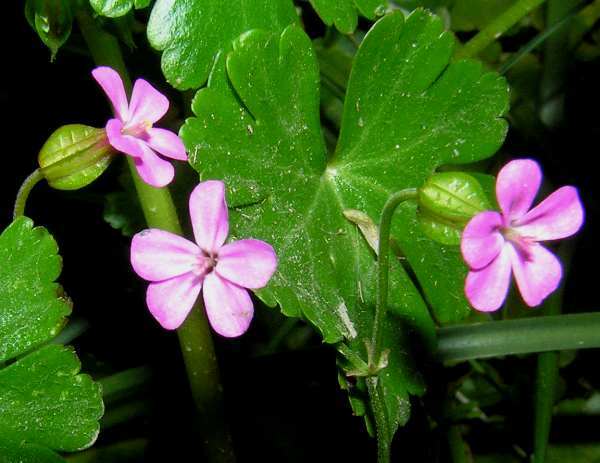 Flowers of Shining Cranesbill are 1 to 1.4cm in diameter - noticeably smaller than those of Herb Robert - and deep pink; they each have five unlobed petals. As with other cranesbills, the seed capsules have long beaks and are slightly ridged, but they are not noticeably hairy. As the seeds ripen the capsules turn red especially at the tips. Geranium robertianum is very common throughout Britain and Ireland, and it is found also in many mainland European countries, including Slovenia. Its natural range extends down to northern Africa and across into western Asia. 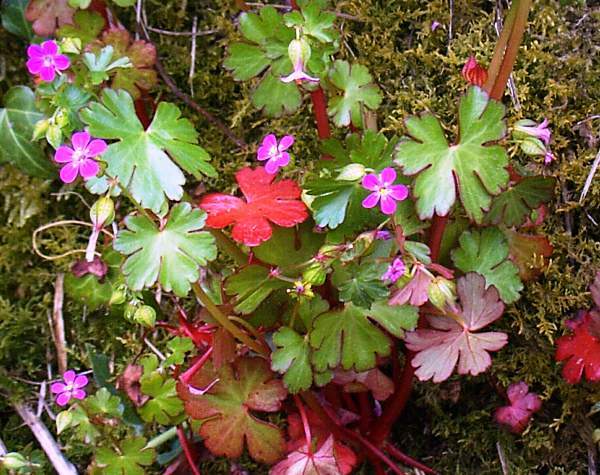 Elsewhere in the temperate zone, including the Americas, Herb Robert is an introduced but now naturalised species, and in some places this plant is now considered to be a noxious invasive weed. Shining Cranesbill favours steep dry banks, rocky walls and other fairly barren sites, and so it is mainly a wildflower of country lanes, wasteland and garden boundaries. Alkaline to neutral soil seems to suit this flower well, but it can also cope with moderately acidic soil. In Britain and Ireland this is one the earliest of the cranesbills to bloom in any quantity. The first flowers appear in May and by the end of July only the stragglers are left; however, a few flowers keep on coming until at least the end of August and often well into September. The red stems and glossy leaves add a welcome splash of colour to the countryside when most of the wildflowers have dropped their petals and closed down for the year, so Shining Cranesbill is a spring, summer and autumn delight. Geranium, the genus name, comes from the Greek noun geranos, meaning Crane (birds of the group of species known as the Gruidae). It is a reference to the beak-like fruit (seed capsule) which is reminiscent of the long beak of a Crane. As for the specific epithet, lucidum is a Latin adjective and means shining - a reference to the glossy leaves that shine brilliantly in sunlight. 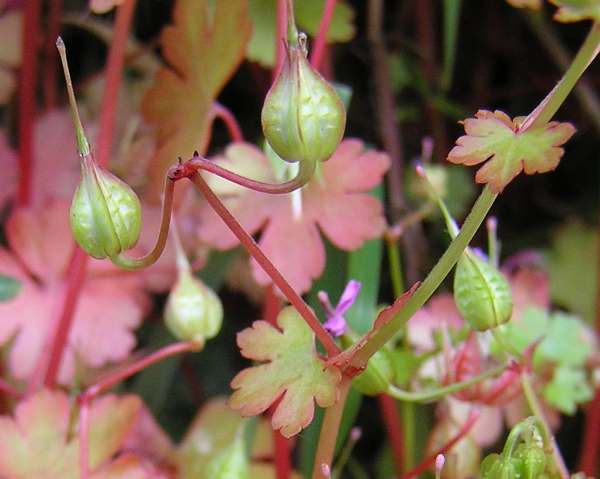 Cranesbills get their common name from the long straight pointed beak that appears at the top of each of the fruit pods. There are reports that this plant may have diuretic and astringent properties, but please note that it is essential to seek expert advice before using any plants medicinally. Herb Robert Geranium robertianum is a more hairy plant with rather larger and usually more abundant flowers. The photographs of Geranium lucidum shown on this page were taken in West Wales during spring and summer.